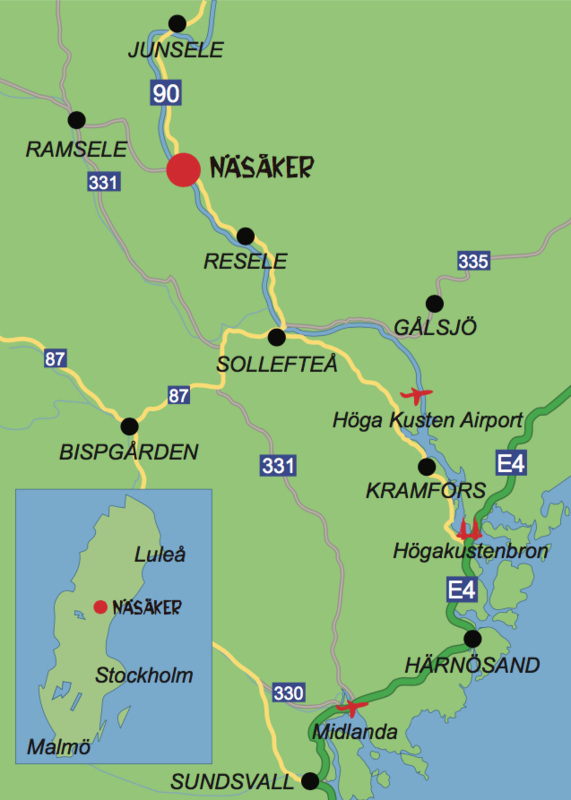 Näsåker is a village situated 43 kilometers from Sollefteå, the nearest town. Below you will find different alternatives to get here, bear in mind there are limited access so plan your trip well in advance. You can go by bus or train, please note that there are limited parking spaces during the festival. You can look for trips at resrobot. There you can find different kinds of bus- and traincompanies in the same search. Din Tur drives local buses between Sundsvall-Sollefteå and Sollefteå-Näsåker. No cash payment on the buses! You can book your entire trip, includinge change of trains, at SJ’s website www.sj.se – all the way to Näsåker from e.g. Stockholm, Malmö, Gothenburg, Umeå or other locations. Travel affordable directly from Stockholm to Urkult with the Urkult train! The train stops at Ådalslidens station in Näsåker, 600 meters from the festival area. Livemusic och lots of pleasant company onboard! Car-pool by bus from Stockholm directly to Urkult with Glädjetåget. The association Glädjetåget is run by the cooperative Kontrabuss, alternative transport in anarchic spirit. Y-byss ybuss.se drives buses to Urkult on wednesday and thursday, and back again sunday. This year you’ll be able to ride with Y-buss from Stockholm, Uppsala, Gnarp, Sundsvall, Timrå, Härnösand and Kramfors to Näsåker. Back from Urkult the range of bus stops will also include; Hudiksvall , Söderhamn and GävleBro. Find a car-ride to Urkult! “Skjutsgruppen” consist of thousands of private people who would like to share rides all over Sweden. The Facebook group for Urkult is one of their biggest. It is important to know if you come by car that parking possibilities in Näsåker are very limited. 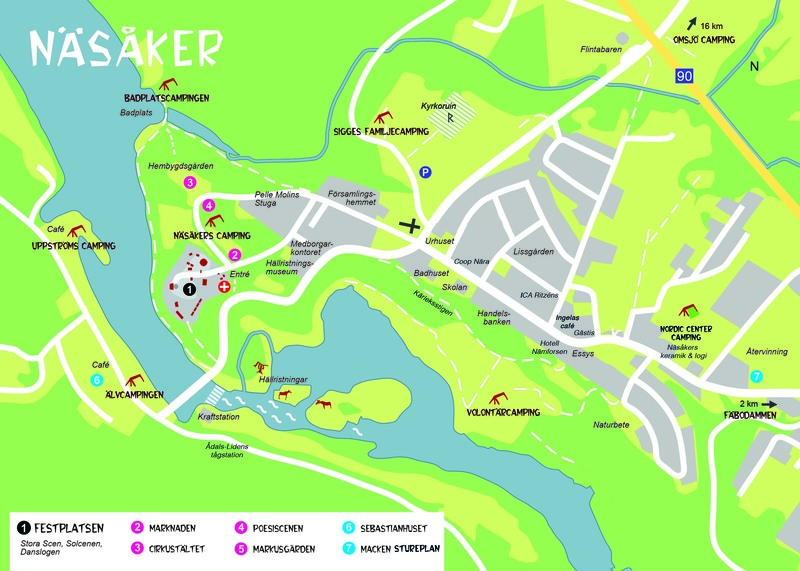 During the festival parking will be temporarily prohibited in most parts of central Näsåker, anyone who parks where parking is prohibited will risk being fined. You are best of buy parking your car in the large parking area (paid parking) located between the church and state highway 90, next to Sigges Family Camping (see map). Parking fee is 50 SEK for one day or 100 SEK for the whole weekend. You can pay by cash or Swish. If you move your car that means you have left your parking spot and you need to pay again if you want to return it to the car park (not more than 50 SEK if you have already paid once). The reason to the parking prohibition is first and foremost to make sure emergency service and ambulance will be able to get through unhindered and to minimize risks for accidents and inconveniences.